This individual Report Innovations in Online Bill Payments is available for purchase. This Report is available to members of Mercator Advisory Group’s Emerging Technologies Advisory Service. Please be advised that this Report is normally part of a research and advisory service that provides ongoing support throughout the year. As such, this Report contains significant depth of content that is selected for its strategic importance to our members. (For a description of these services, see our Advisory Services section). From its inception, online bill payment has made waves in the industry. The latest research from Mercator Advisory Group explores developments in online bill payment and their effects on the industry's future. Beginning with a look at the two generally accepted bill payment models, direct-biller and consolidator, the report looks at how a new online bill model, the Direct-Aggregator is changing the billing game. Direct-aggregators stand to capture significant customer attention and slow the growth of consolidator sites. "Online bill payment is a complicated industry where small changes to infrastructure, business models and consumer behavior can have dramatic effects. In the last year or so, both the rules for online bill payment and the players on the field have changed." According to Mike Friedman, Director of Mercator Advisory Group's Emerging Technologies Service and lead analyst on the report. "There is plenty of room for continued growth in online billing; however, the strategic playbook that was in place only a few years ago, may already be outdated." 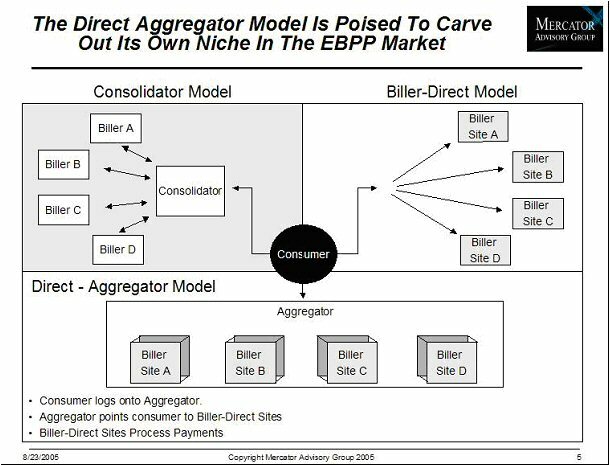 In Innovations In Online Bill Payment, Mercator Advisory Group examines the three business models defining online bill payment in today's market. The research also identifies the shifting strategic focus of online bill payment sites and how FSI's offering pay-anyone solutions will need to adjust. With online bill payment being offered more and more as a free service by consolidators, the use of premium services and cost-saving measures will be critical to continued success. The report examines both available premium services and the steps banks can undertake to lower the cost structure of their bill payment divisions. The report also looks at the competitive landscape and discusses new products and features at leading online bill payment sites. New businesses are entering the online bill payment space with innovative approaches to capture customer attention. Drawing from refined understanding of consumer preferences, companies are tailoring their offerings to capture more specific and segmented demographics.